What is Hypertension (High Blood Pressure)? Hypertension occurs when the systolic blood pressure is equal to/greater than 135 mmHg & the diastolic blood pressure is equal to/greater than 80 mmHg. If left uncontrolled, hypertension can cause heart attack, stroke, dementia, kidney failure, vision loss amongst the serious consequences. Is it normal for my blood pressure to vary? Yes, it is quite normal for people’s blood pressure to change throughout the day & night, or in different settings where you may measure your blood pressure. Many things, such as stress levels, food or drink intake, activity levels, even time of day can all affect a person’s blood pressure reading at any given time. In fact, there are published studies that show a given person’s blood pressure can change by up to 20mm within a day, based on activity levels, food/drink intake, stress, etc. This is why it is important to take your blood pressure on a regular basis, & review the overall trend of your blood pressure readings with your doctor. One should not be too concerned about one single measurement. It is important to take measurements every day at the same time & to know one’s own BP trend, as BP continually changes throughout the day due to the daily fluctuation cycle & many other factors. When is the optimal time to measure blood pressure? It is optimal to measure blood pressure within 1 hour after you get up in the morning & before you go to bed at night. If you measure your blood pressure in the morning, take the measurement within 1 hour after you get up; before having breakfast & after visiting the restroom, rest for 1-2 minutes & then take the measurement in a sitting position. If you measure your blood pressure at night, after resting for 1-2 minutes, take the measurement in a sitting position before you go to bed. It is recommended to take the measurement at the same time period every day. Will I see differences between my readings at home compared to readings in my doctor's office? 1. A person’s blood pressure varies throughout the day, so at any given moment your blood pressure can change. 2. In terms of the amount of change; there are published studies that show a given person’s blood pressure can change by up to 20 mm within a day, based on activity levels, food/drink intake, stress, etc. 3. You may have a condition known as “White Coat Hypertension.” This is a condition in which a blood person’s blood pressure rises above its usual level when it is measured in a doctor’s office or clinical setting. 4. You may have a condition known as “Masked Hypertension.” This is a situation in which a person’s blood pressure falls below its usual level when it measure in a doctor’s office or clinical setting. So do not be alarmed when you see differences between your readings at home compared to your readings in your doctor’s office. Discuss it with your doctor to get the best overall picture of your heart health. How do I measure my blood pressure correctly? 1. Sit quietly for about 5 minutes with both feet flat on the floor. Both readings are important. Systolic blood pressure measures your blood pressure during a heart contraction & the other measures blood pressure between heart contractions. Usually, more attention is given to systolic blood pressure, as it indicates a major risk factor for cardiovascular disease. For your particular situation, you should discuss both measurement results with your doctor. Why is it important to monitor blood pressure at home? Monitoring blood pressure at home has been found useful in helping to monitor the effects of hypertension drugs, as well as detecting masked hypertension & symptoms that are hard to be found otherwise. For these & other reasons, medical organizations around the world now stress the importance of home blood pressure monitoring. Click below to find out more about Omron’s line of upper arm & wrist home blood pressure monitors. What is the difference between monitoring blood pressure using a home digital monitor as opposed to getting my reading when I see my doctor? Digital monitors measure blood pressure oscillometrically rather than by auscultation. In auscultation, stethoscopes are used to take blood pressure by listening for specific heartbeat sounds which the doctor then uses to determine systolic & diastolic pressures. Oscillometric technology measures the vibration of blood traveling through the arteries & converts the movement into digital readings. Omron digital blood pressure monitors use the oscillometric method of blood pressure measurement. An oscillometric monitor does not need a stethoscope so the monitor is simple to use. It is also important to note that home blood pressure monitoring allows you to monitor frequently & share the results with your doctor if you desire. What does oscillometric technology used by home digital monitors mean? Oscillometric technology measures the vibration of blood traveling through the arteries & converts the movement into digital readings. Are the readings different between an upper arm blood pressure monitor & a wrist blood pressure monitor? It is quite possible that your readings may be different from your upper arm to your wrist as blood pressure varies throughout the human body. All Omron blood pressure monitors, whether upper arm or wrist, are validated in the same manner & have the same accuracy specifications. Which blood pressure monitor- upper arm or wrist should I purchase? In terms of which type of blood pressure monitor is best for you, we recommend that you discuss this with your doctor, based on your individual needs. 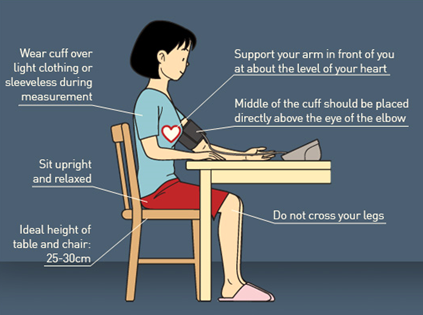 Upper arm blood pressure monitors are recommended for people who buy a blood pressure monitor for the first time or people who have high blood pressure & need to control it. Are digital blood pressure monitors accurate? This meets or exceeds the AAMI (Association of Medical Instrumentation) standards. To understand the accuracy levels of other manufacturer’s blood pressure monitors, you need to contact them. It is always important to investigate accuracy & ease of use before purchasing a home blood pressure monitor. How often should I send my Omron blood pressure monitor for checking? The accuracy of Omron blood pressure monitor has been carefully tested & is designed for a long service life. It is generally recommended to have the unit checked every two years to ensure correct functioning & accuracy. Please consult your local Omron representative for the check.